Day four of the tournament was a hoops-fest featuring two blowout wins and two very tightly contested games. Four games in total, so much basketball to discuss, let’s begin. Mozambique women played Zambia in what can best be described as a David vs Goliath matchup. In a game where Mozambique had seven players scoring in double figures, and every one of the 12 players scoring, Zambia was overmatched in each and every category. Mozambique had a 55-24 rebounding advantage, grabbing more offensive rebounds (28) than Zambia’s total rebounds. They also record 29 thefts, as this fuelled their transition game. They gave out 34 assists while Zambia only recorded 10, they made 80% of their free throws, converted on about 51% of their field goal attempts and had a decent 29.7% success rate from beyond the arc. Zambia had 50 turnovers, which at this point is a tournament high. In summary, Mozambique torched Zambia for 42 points in the first quarter, which matched Zambia’s final point total. A lopsided victory goes to undefeated Mozambique as they took this one 123 – 42. Stat of the game: Annabel Costa (6) played in only 9 minutes 57 seconds and notched a game high 19 points, along with 2 assists and 2 rebounds. The second game of the day between Zambia and Zimbabwe men featured a gutsy performance by Zambia, who seem to have taken upon the moniker of the “Comeback Kids” (more on that later) in this tournament. Both teams started the game slow with a mediocre 12-10 first quarter performance in Zimbabwe’s favour. The second quarter saw Zimbabwe racing out to a 10-3 run early and seemingly taking control of the contest. They outscored Zambia 26-10 in this quarter and had a comfortable 18 point cushion heading into the half leading 38-20. In the third quarter, the roles were reversed, as Zimbabwe looked shell-shocked at the energy Zambia came out with. S Mfwaume (14) sparked this run for Zambia with a step back 3 pointer, followed by a spin in the lane and fade away jumper that is reminiscent of a younger Kobe Bryant. He came back on the next possession and drained another 3 pointer half a metre away from the three point line. The momentum was shifting to Zambia’s favour as Mfwaume had just scored 10 points in under 3 minutes. Zambia was also now employing a 2-2-1 full court press to force Zimbabwe to turn the ball over and to rush their offense. Most of Zimbabwe’s 26 turnovers came in this period. By the end of the third period, Zimbabwe had a narrow 48-46 lead and they had been outscored 26-10. The fourth quarter begins, fans, media, and players alike are on the edge of their seats to see what else these two teams had in store for us. The teams go back and forth, methodically, prancing around each other like seasoned boxers, and at the 04:00 mark in the fourth; Zimbabwe up 57-56, the fun begins. 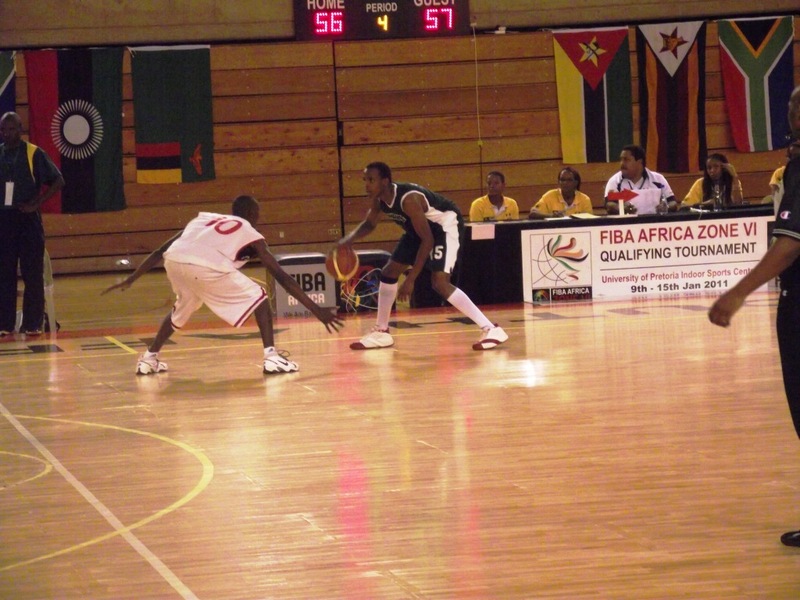 C Mufwaume (10 Zambia) drains a 3, Tatenda M (9 Zimbabwe) answers back with a 3 pointer of his own. S Mfwaume (14 Zambia replies) with a 14 foot mid range jumper, and on the other end F Tumbare (4 Zimbabwe), drains a tough baseline jumper. It’s starting to look like a fast paced tennis match as fans heads swing left and right in unison on each possession taking in the action. However, Tawanda Chitsinde (15 Zimbabwe) wore his heart on his sleeve and provided the play that sparked the final run for Zimbabwe, driving to the basket for a three point play. He makes his free throw, and Zimbabwe start trapping the Zambian defenders and running in transition, getting to the free throw line. He has a hand in each of the final possessions for Zimbabwe and he is proving that he can be much in the clutch. In the end, Zimbabwe hold on through sheer will, tenacity to win this one 71-66 over Zambia. S Mfwaume (15) had a team 15 points, while A Mwansa (7) had 11 rebounds for Zambia. Tawanda Chitsinde (15) had 14 points, 5 assists, and 4 rebounds in 30 minutes of action for Zimbabwe.